Our Heart-In-Heart Pendant with large heart shaped hole looks perfect on our silver bead necklace chain. Personalize with your own inscription on the front. 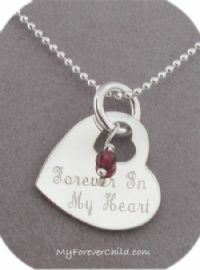 Personalization on the back of the pendant is optional. Select your choice of engraving font in the drop down box below. 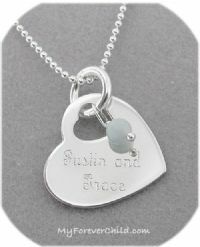 Comes with a sterling silver ball chain necklace, select length below. Genuine Gemstone Dangle is optional, select month in the drop down box below.